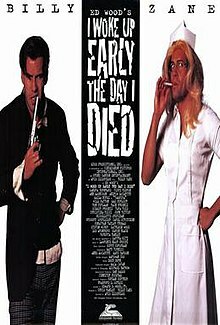 I Woke Up Early the Day I Died is 1998 American camp comedy film written by Edward D. Wood, Jr.. The film, directed by Aris Iliopulos, stars Billy Zane, Tippi Hedren, Ron Perlman, and Christina Ricci, among many others. The film has no dialogue, only atmospheric sounds, alternating bursts of laughter, and screams. The movie, produced two decades after Edward D. Wood Jr.'s death, was aimed at being a tribute to him. Wood was awarded a posthumous Golden Turkey Award for being The Worst Director Of All Time, and has since gained a cult following. The producers of this film used many techniques that Wood himself would use, such as including stock footage to save filming expenses. The cast was made up of a huge list of actors, including several who were previously associated with Wood's films. The film received negative reactions by fans and critics alike, achieving a 30% rating on Rotten Tomatoes. Many criticized Iliopulos's failure to recreate Wood's innocent ineptitude at film making, including Entertainment Weekly, which said the movie "never truly finds a way to evoke [Wood's] fractured hard-boiled syntax, his inimitable idiocy". The instrumental soundtrack for the film was composed by Larry Groupé and recorded and mixed by John Kurlander. There is additional music featured in the film that was not composed by Groupé. These songs were never released in compilation as a soundtrack to the film. The following is the listing of songs as they appear in the end credits of the film. ^ Medved, Harry and Michael. The Golden Turkey Awards. 1980, Putnam. ISBN 0-399-50463-X. ^ "I Woke Up Early the Day I Died". www.iwokeupearly.com. ^ "I Woke Up Early the Day I Died". 17 September 1999. ^ "Larry Groupé - Composer". www.larrygroupe.com.